One week after President Donald Trump and Xi Jinping shook hands over a 90-day trading truce, investors are worrying whether recent events with a prominent Chinese company could derail potential trade talks. Over the weekend, authorities arrested Meng Wanzhou, the deputy chair of Huawei’s board, the chief financial officer, and daughter to the founder Ren Zhengfei. The arrest comes after suspicion from the United States that Wanzhou violated U.S. trade sanctions against Iran. Wanzhou now faces extradition to the United States. Wall Street wasn’t too thrilled over the arrest news. Upon opening the day on Thursday, the showed uncertainty, especially in the Huawei stock. The stock dropped by 2%, and there are even more significant losses in Hong Kong and Tokyo. The S&P 500 fell 45 points (1.69%) to 2,654.53. The Dow fell 417 points (1.67%) to 24,609.65. The overall Asia market has slumped overnight over the arrest news. The worry is that the arrest of such a prominent business figure could cause a rift between the Chinese and American government. Investors legitimate worries have boiled over into the stock market as they move away from riskier assets as the numbers have shown today. It’s likely that China will view the CFO’s arrest (which happened on the same day President Trump and Xi Jinping had supper together in Buenos Aires), will be looked at as an attack on one of the most top corporate moguls in China. Her father, Zhengfei, could be viewed at as the Bill Gates of China. The billionaire’s company could easily claim the title as China’s most global technology company as its spread into Europe, Asia, and Africa. 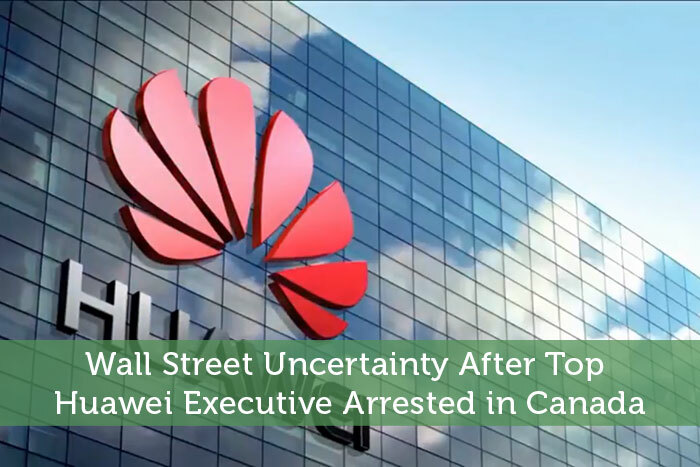 Since the arrest, Huawei has seen very little information regarding the charges, extradition, and the events of the arrest. Back in April, the Wall Street Journal reported that U.S. prosecutors were investigating whether or not Huawei violated U.S. sanctions in relation to Iran. The U.S. Justice Department also have probed the company due to allegations that Huawei has used their technology to spy on Americans. The United States has pressured other countries, including Canada, to block the Chinese company from installing their 5G mobile networks. The U.S. and Australia have already done so, with New Zealand blocking the first attempt of bringing in Huawei. The pressure from the U.S. to Canada continues to grow as Republican Senator Marco Rubio, wrote to Prime Minister Justin Trudeau to bar the Chinese technology. Huawei’s ambitions have pushed them to be a “global powerhouse.” However, the arrest is likely to hurt any remaining support the company has in Western countries and to try and gain new business. The Asian stock markets didn’t take the news lightly. The leading index in Hong Kong fell over 2.5%. In Tokyo, the stock market dropped almost 2%, while the Shanghai’s market fell about 1.7%. Huawei suppliers AAC Technologies (AACAY) and Sunny Optical (SNPTF) quickly dropped around 6% in Hong Kong. Although with uncertainty looming in the back of the governments and investors’ minds, China still believes they can reach a trade deal with the U.S. sometime early 2019.